With everyone tightening there belts at the moment , it means that we can’t splash out on expensive items & goodies for our other halves as much as we would like. But that doesn’t mean it cant be just as special! in fact, most people would prefer a handmade, straight from the heart gesture more than a bunch of expensive roses or a pair of cuff links! Here are a few Ideas for a thrifty Valentines Day to make your partners heart melt! 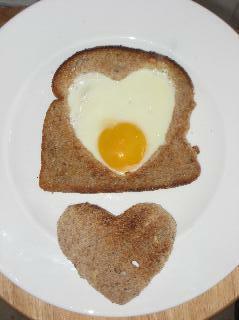 Use a heart shaped pastry cutter or a knife to cut out a shape in the middle of a slice of bread. Toast the heart shaped bit from the middle.